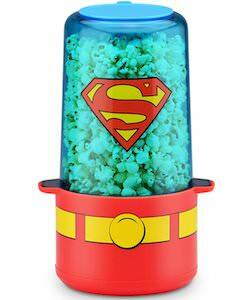 Movie night is here with fresh popcorn made with this Batman Popcorn Maker. The popcorn maker is not only great for making popcorn it also works as a serving bowl and all is also clearly Batman themed. 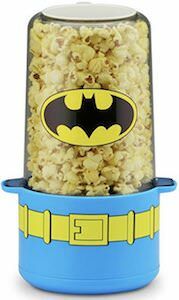 The popcorn makers base is light blue with the famous yellow tool belt that Batman wears and then there is the top where the popcorn is made into witch is see through and has the Batman logo on it and this also works as a bowl to eat the hot popcorn from. 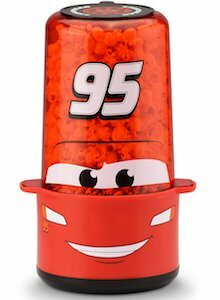 There are also two spoon included one for measuring the popcorn and one for measuring oil if you like that on your popcorn. 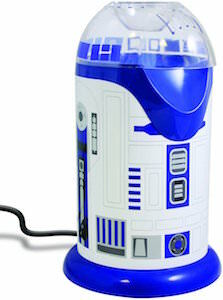 If you like Star Wars and popcorn then you need this R2-D2 popcorn maker that looks just like the famous droid. The hot air popcorn maker is about 13 inches tall and is blue and white of course and looks like R2-D2 and it has a see-through dome on the top where the popcorn kernels go in and where the popcorn will come out. Freshly popped popcorn is a healthy snack and now you can make as much as you want. We all know you need this popcorn maker and I am sure that it will look amazing in your kitchen.